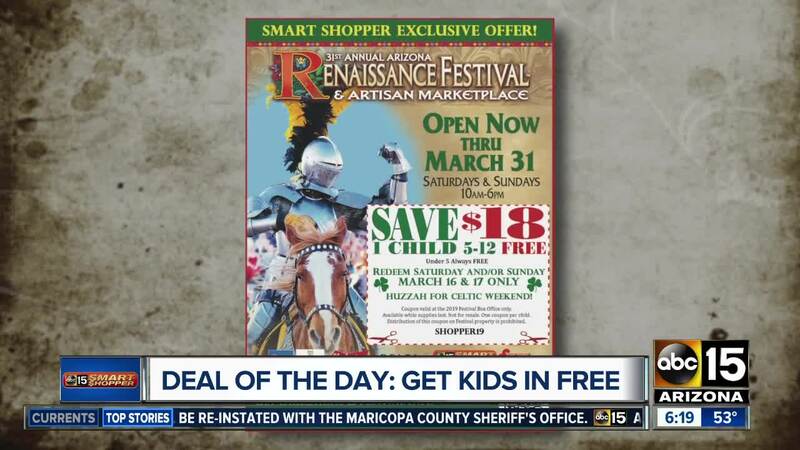 Deal of the Day: Get your child into the Arizona Renaissance Festival FREE! 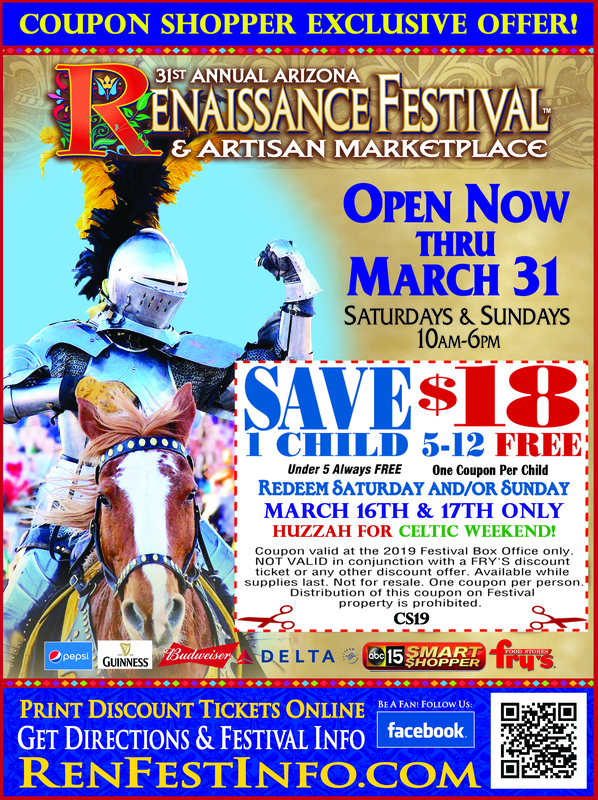 Save money at the Renaissance Festival! The Arizona Renaissance Festival is going on now through March 31, and we are teaming up to score you a Deal of the Day so you can enjoy all the new stuff without paying full price! There are all kinds of fun attractions like escape rooms, bands, hypnotists, glassblowing, fashion, jousting, dancing, knighting ceremonies, fair food and so much more! Here's a reminder: admission prices have gone up! Kids under five years old are free, kids ages five to 12 are $18, and adults are $28 each. With our Smart Shopper Deal of the Day, use this coupon to get your child in FREE this Saturday and Sunday only (March 16 and 17), saving you $18 per kid. The coupon at the bottom of this article needs to be printed and presented at the box office for a kid's free ticket. If you have four kids, you'll need four coupons. The box office will then give you a child ticket, and you proceed through the gate. There are no restrictions for how to get your paid adult ticket. You can either go through the website, box office, through Fry's and more. Click here to see ways to get discounted tickets! Here is the gist. Buying online saves you $1 on admission, at Fry's, save $2, military members and families save $3, and those 60 and older can save $3 as well. The details are here . It is Celtic Weekend, so be sure to wear green! Celebrating St. Patrick's Day at the Renaissance Festival sounds like an epic time!